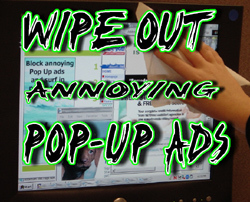 While using the Internet, do you find yourself having to stop and delete those annoying pop-up advertisements? Or worse, finding one message morph into more even when you're not using your web browser? Calling unsolicited Internet pop-up advertisements the next generation of spam, Attorney General Lockyer cautions that persistent pop-up ads could signal that your home computer is open to hackers who can install new programs and view, change or delete data without your permission. One pop-up advertising campaign recently prompted a federal court to issue a temporary restraining order against the company that allegedly had been sending pop-up ads as frequently as every 10 minutes to urge viewers to buy software costing $25 to $30 to block future pop-up ads. The Federal Trade Commission complaint was filed in the U.S. District Court in Maryland. Here are some tips to consider from the FTC for curbing these unwanted pop-up ads and better protecting your home computer from hackers. Pop-up spammers are exploiting a feature of the Microsoft Windows operating systems known as Messenger Service. Despite the name, Windows Messenger Service doesn't have anything to do with instant messaging. Messenger Service is designed to provide users on a local- or wide-area computer network with messages from the network administrator. For example, a company's network administrator might send a message to all its users that the company's network will be shutting down in five minutes. If your home computer is connected only to the Internet, you may not have any practical uses for Windows Messenger Service. Consumer should note that disabling the Windows Messenger Service may not be practical for computers connected to a home or business network. In such instances, your network should be protected by a firewall. Another way to cut off pop-up spam is to run a firewall, software or hardware designed to block hackers from accessing your computer and getting into your programs and files. Firewalls provide the benefit of preventing not just pop-up ads, but any unauthorized access. Some new operating systems, including Windows XP, have built-in firewalls, but they may not be activated. Consumers can find out how to set up built-in firewalls by consulting their online "Help" feature. You can check out several free firewall software programs via the Internet or purchase commercial products. In any case, a firewall needs to be updated regularly to stay effective. A firewall is different from anti virus protection. Anti virus software scans incoming communications and files for troublesome files. A firewall helps make you invisible on the Internet and blocks all communications from unauthorized sources. A firewall is especially important if you have high-speed Internet access through a cable modem or a DSL (digital subscriber line) connection. Consumers can file a complaint about a deceptive pop-up advertisement by using the Attorney General's online complaint form or by writing the Attorney General's Public Inquiry Unit at P.O. Box 944255, Sacramento, CA 94244-2550. Consumers also may file complaints and get more information from the Federal Trade Commission. Be sure your complaint includes the name of the company or Web site advertised in the pop-up spam.